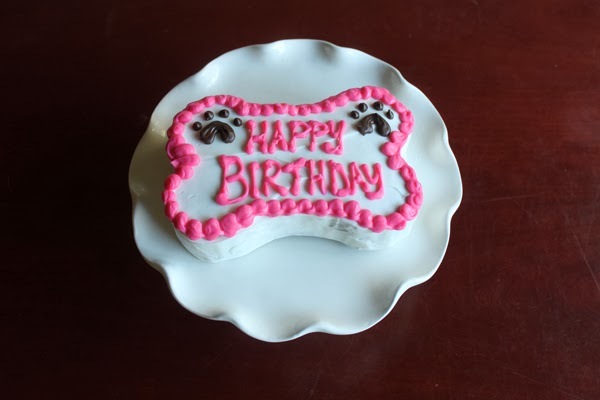 Once Upon a Blog: Happy Birthday to the Dog! Happy Birthday to the Dog! Our dog Daphne just turned three and yes, Nick and I are the kind of people who celebrate their dog’s birthday. We’re not alone. Just search for “dog birthday” on Pinterest. For Daphne’s first birthday, we got her the cutest little doggie cupcakes from Sprinkles (plus a whole lot of human ones), but it was kind of anticlimactic when she and her canine pals gobbled them up in half a second. 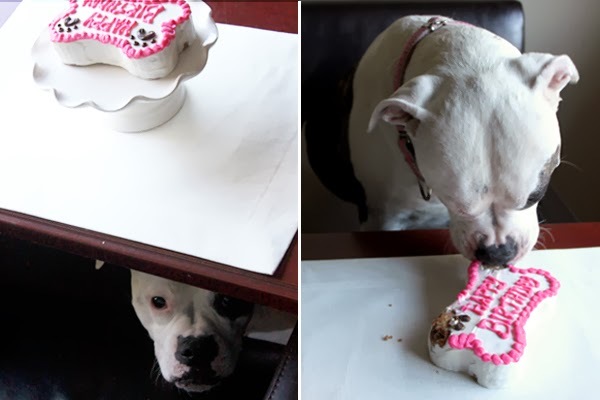 This year, we went a little bigger with a bone-shaped cookie cake from her favorite store, the aptly named Pet’s Delight in downtown Los Altos. We live a few blocks away from this pet shop, and with a big bowl of dog food and cookies always out for sampling, it’s pretty much a mandatory stop on every single walk. If we ever try to skip it, she will lay down in the middle of the street until we give in. It’s pathetic, but I can relate. I’ve done worse things for a cookie. Pictures were mandatory and inspired by the cutest cake smash photo session found on our favorite doggie website. Daphne was a bit nervous at first and rightfully suspicious when we invited her to sit at the table. She hid when Nick said, “Do you want your birthday cake?” because apparently it sounded too much like, “Do you want to take a shower?” (It was all in the inflection—super high at the end. Way too high for a grown man. Even Daphne’s dog-whistle-calibrated ears thought it was too high.) She came out when she was certain that birthday was different from baths, took a seat, and quickly learned that cake is her new favorite word. 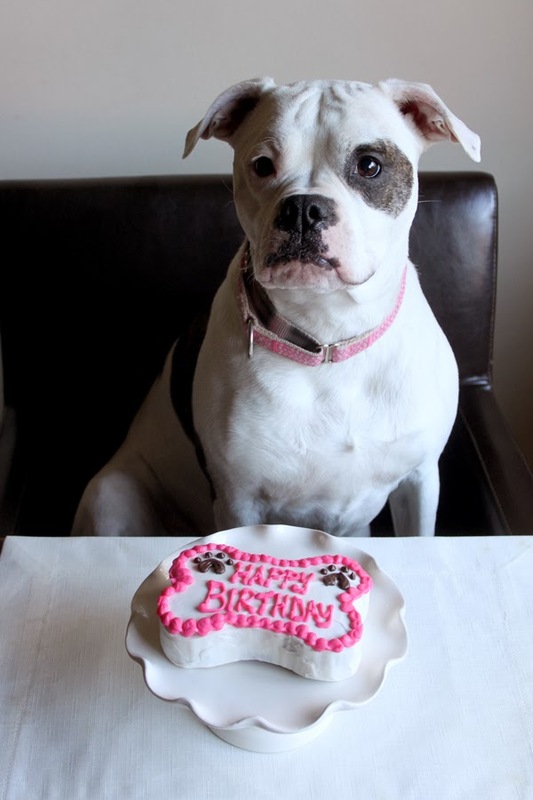 Your turn: Do you celebrate your pet’s birthday? P.S. Here are Daphne’s puppy pictures because we’re also the kind of people who do a family photo shoot with their dog. Obviously. Aww this is the cutest thing! Happy Birthday to Daphne! So adorable!! We just celebrated Lucy's birthday about a month ago, and Lola's is this Sunday. I baked cookies for Lucy with special icing and for Lola I'm going to attempt one of those doggie cakes you can find on Pinterest - there is some recipe that involved layering canned food with treats. Sounds gross but the dogs will love it! What lucky girls! I bet Lucy loved her cookies! I'd love to hear about what's in the special icing that you used! Also, that is too funny about the layered cake with canned food. Please blog about it! I want to see some pictures of how it turns out! Happy birthday to both of them!